Click to request exam/eval forms. ScanTron printing, scanning, and data processing solutions are available for multiple-choice objective tests, surveys and evaluations. Exam forms will be generated from your current class list in ISRS. You will receive an answer key with your name and course id, and an answer blank for each student containing their first & last name, their tech id number, your class id#, and the title of the class. Evaluation forms will be generated from your current class list in ISRS. You will receive an answer blank for each student that contains a random untraceable id#, your class id# and the name of your course. For more information on class evaluations please see the Center for Professional Development page here. Request pre-printed forms by filling out the online request form, or by emailing your Class ID# (ex. 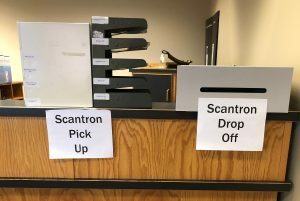 153248) to scanresults@bemidjistate.edu. Pick-up pre-printed and graded exam & eval forms in Deputy 161 – they are on a shelf labeled with the name of your office building. Drop-off exam & eval forms that are to be scored, in the designated box just inside the door of Deputy 161. Please Note – Under normal conditions, exam results and forms are available in approximately 24 hours from the time requested. This timeline may increase during mid-term and final weeks.